Planter’s Punch is more of a drink category than a single recipe. In its simplest form—rum, sugar, lime (or lemon), water, perhaps some tea, and spice or bitters—it is clearly the direct descendant of the classic rum punches of the seventeenth and eighteenth centuries. History suggests that the name “Planter’s Punch” didn’t appear until late in the nineteenth century, with the start of Caribbean tourism; the various island hotels that sprang up to serve the well-to-do traveller needed to serve a drink that had a nice, upscale ring to it. What until then had been simply “punch” provided a perfect opportunity, and “Planter’s Punch” became the ubiquitous hotel beverage. But Planter’s Punch wasn’t limited just to Jamaica. As Jeff Berry points out in his excellent Potions of the Caribbean , classic punch stylings were regional. The punches of each island or plantation area reflected the products locally available, and often included other interesting things, like tea or wines, that could be imported from their parent empires. “Planter’s Punch” followed the same model. The simpler Planter’s Punches are very simple affairs indeed, classic seventeenth and eighteenth century punches. Local rum, citrus, sugar and water or tea, with perhaps a bit of Bermuda nutmeg grated over the top. In its more ornate expressions, Planter’s Punch included embellishments like fruit jellies and wines. These more imaginative punches were harbingers of the post-Prohibiition tiki fashion—multiple rums, multiple tropical juices, even multiple sweeteners. A perfect setup for Don the Beachcomber. In the twentieth century, we finally saw “One of Sour, Two of Sweet, Three of Strong, Four of Weak;” then “One of Sweet, Two of Sour, Three of Weak, Four of Strong” (this from Myers and Son Rum Company). Quite a progression, but it does suggest that you can make Planter’s Punch at any strength that pleases you, and helps to explain all the variants that have shown up in bar manuals over the decades. Shake vigorously and pour, without straining, into a Collins glass. Pack glass to top with crushed ice, and top up with soda water. Churn with a spoon (or swizzle) until the glass starts to frost up. Garnish with fruit as desired; serve with straws. Very simple, sort of a dark rum version of the classic Daiquiri, but with the addition of bitters. And, of course, the traditional crushed ice presentation. This version is simple and elegant at the same time. I had never used tea in a cocktail before I came across this formula, and so I was surprised at how well rum and black tea combine. 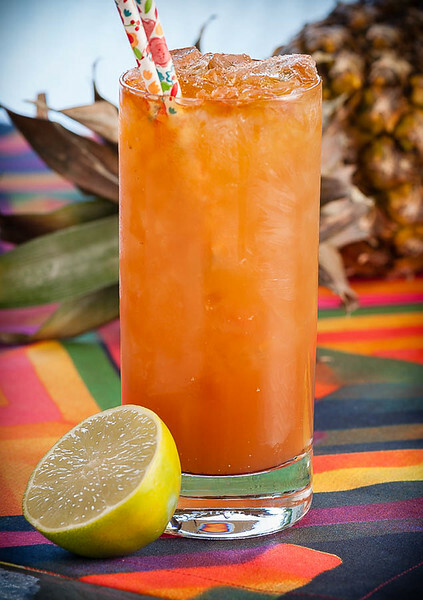 It seems to mediate between the rum and the lime, complementing both and helping to tie the flavors together. I have seen Planter’s Punches with all sorts of exotic garnishes—it did evolve into a tiki drink, after all, with a fancy mug, lots of fruit and greenery sticking out the top. I prefer a simple dusting of nutmeg; it doesn’t look as exotic, but it gives Planter’s Punch a wonderful nose, and is certainly a classic punch garnish. It is also very, very cold. The flash-mixing with the blender will frost your glass in no time. And it takes a long time to drink this version—the blendered ice will freeze your drinking straw closed if you leave it buried in the punch. This is a punch that is well served by a float of Lemon Hart 151 over the top of the crushed ice, to boost it a bit as the ice melts and dilutes the drink over time. I usually just double up the Jamaican rum instead of including the Virgin Islands rum specified in the recipe. It’s not that I have anything against V.I. rums, I just happen to like Jamaican. And I don’t have a lot of storage space for more rums in the pantry. But it’s an interesting idea, and typical of Donn Beach: V.I. rum is a lighter style than Jamaican, and would lighten the flavor of the drink a bit, compared to all-Jamaican rums. There seems to be an endless list of Planter’s Punch variations, too many to list here. It is a fine opportunity for experimentation, for developing a “house style.” These punches run the gamut from simple, rum-heavy Daiquiri-like mixes to fruity and ornate, even baroque, tiki stylings. So pick your style and dive in to one of the Caribbean’s original cocktail. It’s hard to go far wrong. “Planter’s Punch” at cold-glass.com : All text and photos © 2014 Douglas M. Ford. All rights reserved. Tiare (amountainofcrusedice) and JFL (ratedRcocktails) both have a nice review on Planter’s Punches. That’s what’s so fun about Planter’s Punch, there are so many variations. I have seen those articles, and I recommend them to anyone with an interest in more ways to make Planter’s Punch. Thanks for the reminder. I feel like writing about PP in August and your post really inspire me 8) Excellent photos, as usually. Hi, scomorokh, it’s great to hear from you. I’ve been intrigued by the history of Planter’s Punch, and of punch in general, for the last couple years, since I read David Wondrich’s Punch. What I gather from that history and from Jeff Berry’s Potions of the Caribbean is that punch in some form was the favored drink almost everywhere in the seventeenth and eighteenth centuries, and only started to decline during the nineteenth century, with the rise of the cocktail era. But a recipe called “Planter’s Punch” didn’t appear until much later as tourism to the West Indies grew, and English writers reported drinks that used that name in the islands of the British empire—specifically Jamaica. So my interpretation is that planters almost certainly drank punch, made with local product, throughout the West Indies and the Spanish main, and the drink known as “Planter’s Punch” was just one of them, chosen and named mostly as a marketing strategy by competing Jamaican hotels—and rum companies. I look forward to learning more about it. And I recommend both Wondrich’s and Berry’s books. I’m looking forward to reading your article. Glad you like the photos, thank you. Thanks for an answer, Doug. It was very interesting and useful for me. Actually I’ve been thinking to write about Planters Punch every summer since I started to lead my blog :) Unfortunately I haven’t got any books you mentioned. But I can use numerous web-librarys, like the Open Library (by the way, do you use them? Could you recommend me something like that?) and thus I can operate a lot of original source. I don’t have experience with Open Library. You can often find interesting things at Google Books (Wondrich’s Punch is there.) Good luck! Last weekend I made a batch of Jim Meehan’s Green Tea Punch from a recipe I found online. It was a fairly simple recipe, rum, lime, Demerara sugar, and tea, but the twist was that rather than black tea it was a mixture of green tea and mint tea. My wife is as into tea as I am into cocktails, so it was perfect for us. A local liquor store had Cruzan light rum on sale for $10, so I used that. It turned out beautifully, and entirely from ingredients we always have on hand. I’ll certainly try out the black tea version now too. Here’s a link to the recipe. I’d think it would be very easy to mix the tea and sugar ahead and make individual drinks with rum and lime juice if you don’t need to make a big batch of punch for a party.